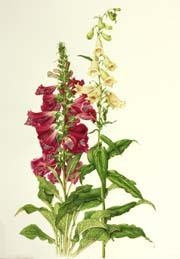 The Common Foxglove, Digitalis purpurea, is a favorite ornamental garden plant, valued for its showy flowers, its colors ranging from purple and magenta to pale pinks and whites, its intriguing speckles and freckles, its mottling and spotting. Every part of the plant is toxic, especially the leaves of the upper stem. After ingesting leaves, stems, seeds or flowers people suffer from nausea, vomiting, diarrhea, abdominal pain, hallucinations, delirium, and severe headache. More acute conditions include irregular pulse, tremors, cerebral disturbances, xanthopsia (jaundiced or yellow vision), blurred blue halos, convulsions and deadly disturbances of the heart. Yet for centuries folk medicine and herbalists used extracts from the plant to treat ‘dropsy’ and various cardiac ailments. In 1775 a 34-year-old Stafford physician and botanist named William Withering heard of an old Shropshire woman who could successfully treat dropsy. The active ingredient in her secret family recipe was digitalis. Withering himself tried the remedy before administering it to his patients. He published his results and acquired a reputation for the treatment of congestive heart failure. Only quite recently has digitalis been superceded by other pharmacological compounds. Irresistible to children’s book illustrators and gardeners, the Foxglove can restore as well as destroy life, giving us reason to marvel at its potency.